This stub category contains upmerged templates which use this category, although they describe a more specific type. If an upmerged template is used on more than 60 stubs you can request a sub-category at WikiProject Stub sorting/Proposals. This category is for stub articles relating to elections in the Midwestern United States - that is, the states shown in red on the map to the right. You can help by expanding them. 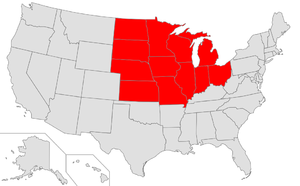 The following states are in the Midwestern United States. All of them have their own election-stub templates. Pages in category "Midwestern United States election stubs"
This page was last edited on 12 November 2018, at 22:36 (UTC).